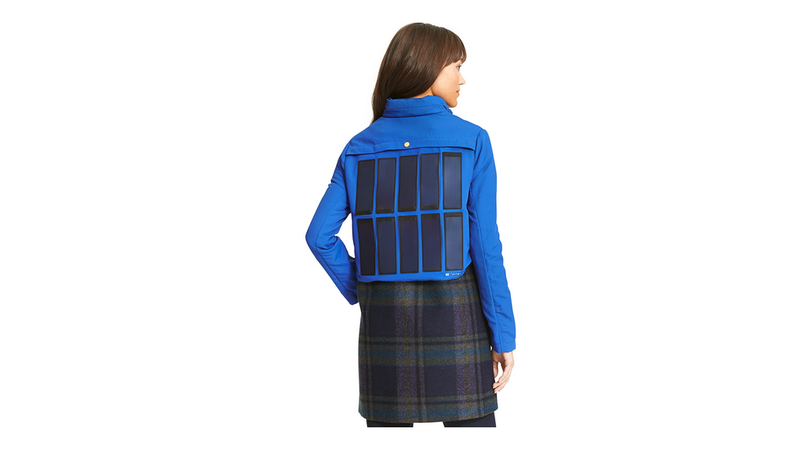 Is it possible to wear solar panels on your back and be fashionable at the same time? The fashionista is selling a solar-powered jacket so that you can keep your phone charged ... assuming, of course, that the sun is shining. Yes, this for real. It costs $599. The solar panel jacket has "a unique and innovative design featuring a solar pack that charges a battery to keep your mobile devices working while on the go," boasts the Tommy Hilfiger catalog. "In direct sunlight, the battery fully charges beyond the capacity of most smartphones." The catalog referred to the jacket as "both stylish and functional." Half of the net proceeds go to the Fresh Air Fund, the company said. Solar-powered clothes may be weird, but not unheard of. L.L. Bean sells a solar-powered hat with LED lights. The designer Pauline Van Dongen also has a line of "wearable solar" coats and dresses that can be used to power smartphones. And other wearable technologies, like smart watches and glasses, are slowly gaining traction.